Suhl, Thuringia, Germany—April 2019… For hundreds of years, arts venues in Europe were designed to have acoustics that supported the type of performance to which each was dedicated. Theaters had short reverberation times for greater intelligibility and concert halls longer times for richness, while opera houses fell somewhere in between. The economics of the 21st century, however, dictate that a single hall be able to support all of these performances, plus seminars, amplified music, and more. Digital technology has addressed this need in the form of ambience enhancement systems. These systems use arrays of ceiling- and wall-mounted microphones and speakers to leverage the natural acoustics of a performance space in simulating a range of spaces with different reverberation times. 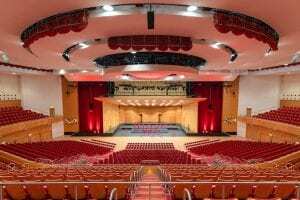 But attaining a natural sound requires components with well-defined pattern control and uncolored response, so when Congress Centrum Suhl installed an Amadeus Active Acoustics System into their 2,350-seat Great Hall, Renkus-Heinz loudspeakers were selected for the installation. The Amadeus system employs far more loudspeakers than microphones. CCS, built in the 1970s and remodeled in the 1990s after Germany’s reunification, had 74 wide-dispersion, ceiling-mounted loudspeakers already installed, but the Amadeus system called for additional speakers on the walls. MediasPro Medientechnik GmbH supplied 35 Renkus-Heinz CX61 compact 2-way Complex Conic loudspeaker systems to complete the installation. Two attributes, in particular, qualified the CX61 for this application. One is its unobtrusiveness. Recessed wall mounting was not possible, so the new loudspeakers had to be surface-mounted, yet not draw visual attention or disturb the hall’s aesthetics. The low profile and white color of the CX61 systems keeps their presence subtle. Even more important were the performance requirements for wide coverage and colorless sound, as these are key to ensuring that no loudspeaker be identifiable as a sound source. Renkus-Heinz’s Complex Conic horn technology is crucial to the CX61’s ability to achieve these goals. Complex Conic horns work with the spherical expansion of the acoustic pressure wave instead of trying to force audio through a rectangular funnel, as with conventional designs. Complex Conic horns provide constant beamwidth, and as pattern control devices, they perform better over a wider frequency band than ordinary horns. This is important in a context where coloration can contribute to undesirable resonances in the reverberation. The CX61’s wide 150-degree by 60-degree coverage provides proper dispersion of the reverberation signals. Clearly, a system employing so many loudspeakers and microphones requires lots of signal transport and many channels of amplification. CCS installed a Dante™ network to carry all of the signals to and from the Amadeus Core processor at the heart of the system. Signals from the 14 Audio-Technica microphones run to an Attero Tech Synapse D16Mio Dante-networked audio interface, which puts the signals through 14 of its 16 studio-grade mic preamplifiers before placing them on the network. Signal outputs from the Amadeus Core flow to the loudspeaker array across the network. The signals are converted to analog by three Attero Tech unD32 Dante-networked interfaces, each of which features 32 analog outputs. The unD32 outputs feed 10 Bittner 8X100 power amplifiers, each of which offers eight channels of amplification.